Welcome to Win it Wednesday! We are now offering challenges, contests and giveaways all in one place! Each Wednesday visit the Challenge Wednesdays blog post to enter to win a gift certificate ranging anywhere from $25 – $100. You may be asked to create a card, leave a comment, post a photo on Instagram or find a hidden message. Who knows what the challenge will be, we just want to make winning gift certificates fun! 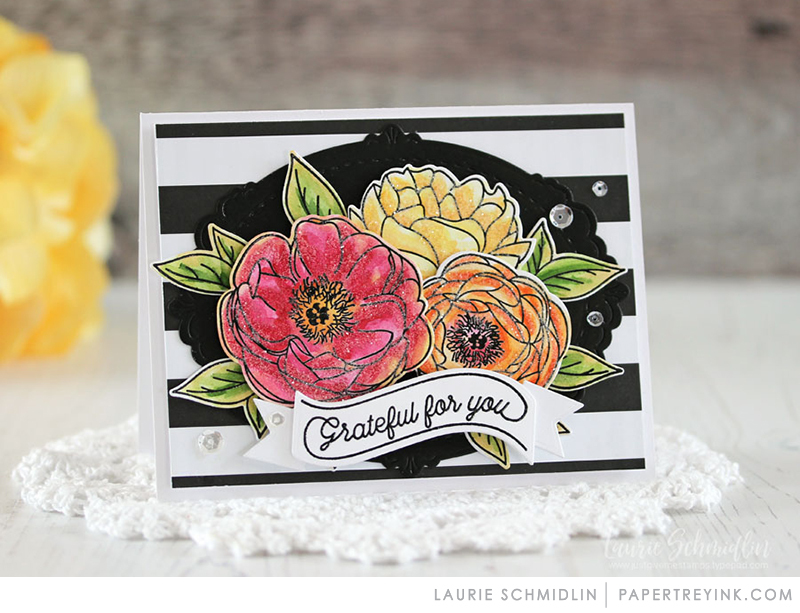 Our newest challenge, called Laurie’s Fabulous Favorites is from the amazing Laurie Schmidlin. Please join her every Wednesday as he shares her favorite Papertrey products. You have the opportunity to join along for a chance to win a $100 gift certificate. One randomly selected winner will be chosen from ALL the entries on Wednesday, February 13th, after 6am. The winner will be posted here on this blog post. CLICK HERE to visit Laurie’s blog to see more! Congratulations, Lyn! Please send an email to customer service and provide them with your full name and the email address you would like your gift certificate sent to. Thanks so much to everyone for playing along! On the “Happily Ever After” card what stamp set did the “Happily Every After” sentiment come from and what technique did she use on the sentiment? 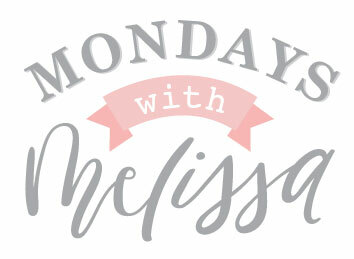 If you need to view Melissa’s post to find clues, click the Mondays with Melissa image above. When you have gathered all of your evidence and are ready to post your answers, please be sure to click the button below to enter. You will have until next Wednesday, February 13 at 6:00 AM ET to enter to win a $25 gift certificate. One randomly selected winner with the correct answers will be chosen from ALL the entries on Wednesday, February 13th, after 6am. The winner will be posted here on this blog post. 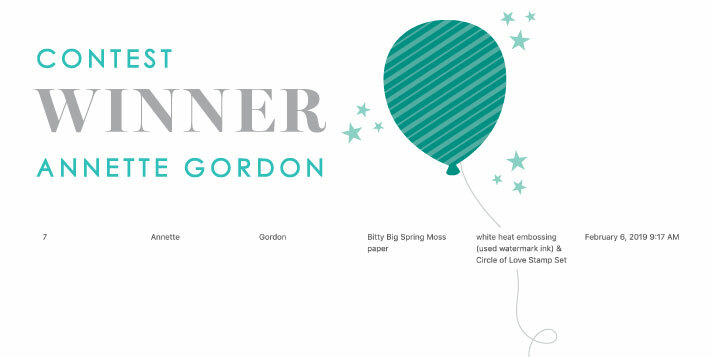 Congratulations, Annette Gordon! Please send an email to customer service and provide them with your full name and the email address you would like your gift certificate sent to. Thanks so much to everyone for playing along! Win a $25 gift certificate if you post this beautiful Valentine’s Day card from Michelle Leone to your Instagram account. 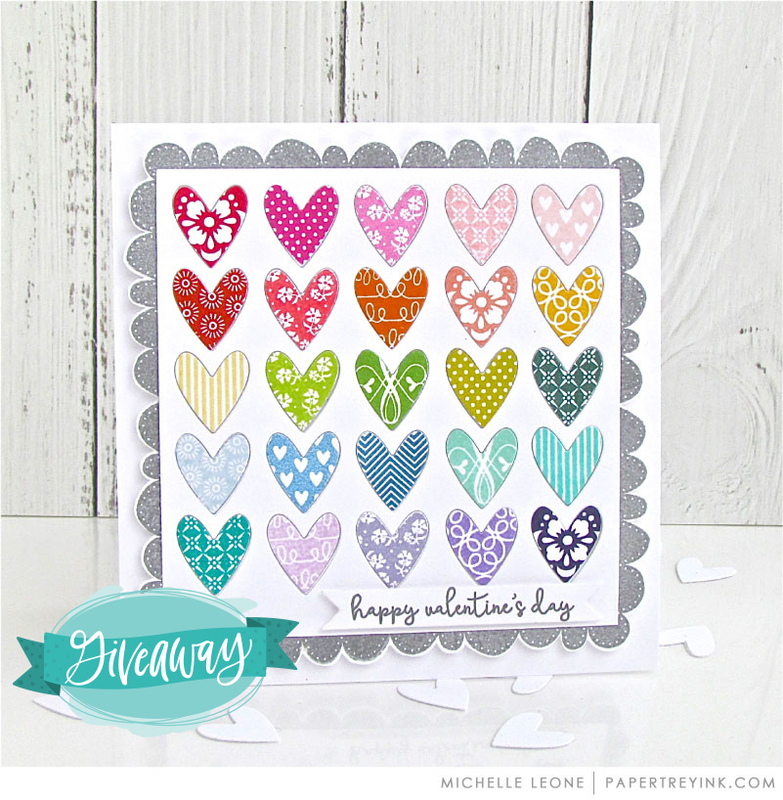 Double your winnings to $50 by making a card using any of the products Michelle used to create this card. Please see additional rules below. Post this photo from Michelle Leone to your Instagram account (if you don’t know how to add this photo to your account, instructions are listed below). Your Instagram account must be public to participate in this giveaway. If you choose to make a card, please be sure it is included in the same post. Add it as the secondary image in the same post. Click the giveaway entry button below to add your Instagram link. You will have until 6am ET, Wednesday, February 13th, to add your link to the list to be eligible to win. One randomly selected winner will be chosen from ALL the entries on Wednesday, February 13th, after 6am. The winner will be posted here on this blog post. The randomly selected winner will get a $25 – $50 PTI gift certificate to spend however they like! Don’t have an Instagram account? You can sign up HERE. Download the Instagram App to your cell phone or other device and log into your account. Go to the Papertrey Ink blog using your cell phone or other device. Open the Instagram App, click on the plus sign (next to the search icon) to add a new post. Choose the image(s) (Instagram Giveaway photo + optional project photo) from your photos. 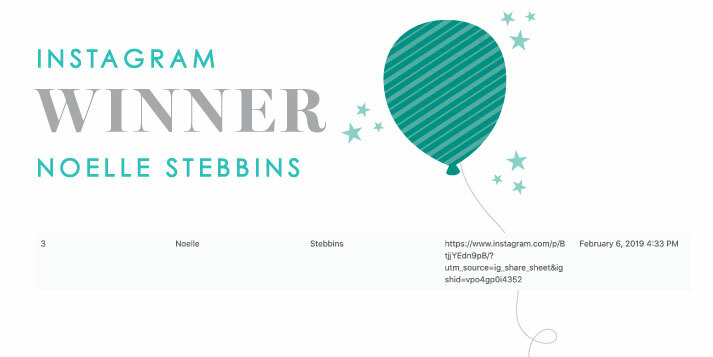 Congratulations, Noelle Stebbins! Please send an email to customer service and provide them with your full name and the email address you would like your gift certificate sent to. Thanks so much to everyone for playing along! Beautiful, Laurie! I love it when a few stamps can fill up a card front and then use a sentiment for completion. I’m a sucker for black and stripes. And glitter? Can’t keep my hands off of it! Big win today! You are such an inspiration Laurie! Will be hard to pick one PTI favorite, I mean really? so many loves…. I hope you’re continuing with 1 entry per person, but I don’t see it spelled out here. Exciting to have a chance at a $100 gc–thank you! I’m thinking Laurie’s challenge is for us to make something with our own favorite PTI products, right? Just like she said–it’s constantly changing with plenty to choose from around here! So is it still one entry per person? I made two cards today with my favorite, but will wait to post until there’s a definitive answer. Thanks. I love your card today Laurie! It is beautiful. Looking forward to seeing more of your creativity. Wow! So many fun ways to win! I’m excited to check them each out. Love win it Wednesday. Your card Laurie is so so pretty! Question 2: Melissa used the “Circle of Love” stamp set for the “Happily Ever After” sentiment on the second card. FYI, Kelsey under the Monday’s with Melissa section there is a dark blue circle and banner image that says, “Enter Contest Here” If you click that image it takes you to a form where you can answer the questions and be entered in the contest. Didn’t want you missing out! For the IG contest, is there a # that should be used? I cannot enter the contest, but like to see projects that others have entered. It would help to have a hashtag to search. Thank you. I agree with you, Helen, but I understand I’m part of the older generation so probably in the minority. 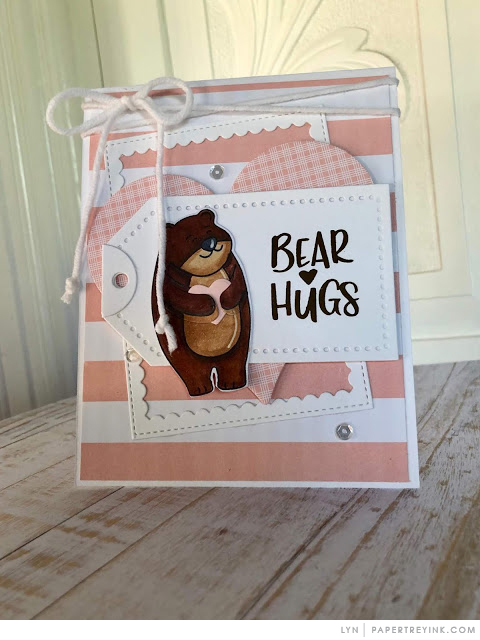 Just glad there’s still at least one cardmaking challenge each week. 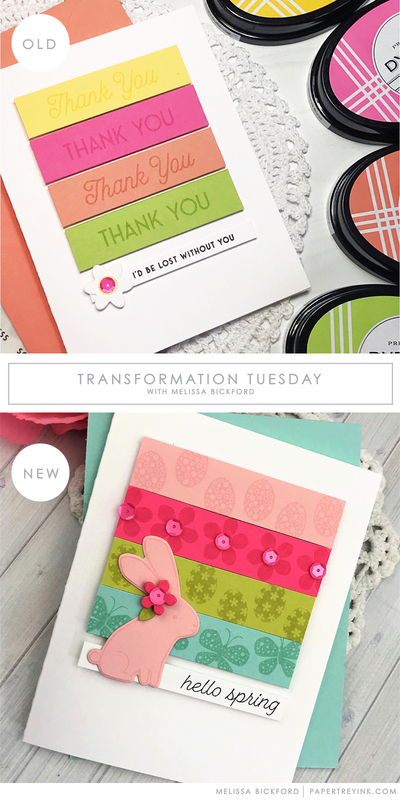 Not sure about Transformation Tuesday as I don’t see it in the WIW post today. Beautiful card Laurie!! Love your choice of flowers and perfect coloring. The bold black and white background really makes those flowers pop! I have to say that this is the most confusing contest, so many things to do in order to win. My answers to the questions about Melissa’s cards are 1. Bitty Big Spring Moss & 2. Circle of love, heat embossing. FYI, Brigit under the Monday’s with Melissa section there is a dark blue circle and banner image that says, “Enter Contest Here” If you click that image it takes you to a form where you can answer the questions and be entered in the contest. Didn’t want you missing out! 1. Patterned paper is Bitty Big Spring Moss. 2. Stamp set is Circle of Love , and the technique on the sentiment is emboss resist. FYI, Denise under the Monday’s with Melissa section there is a dark blue circle and banner image that says, “Enter Contest Here” If you click that image it takes you to a form where you can answer the questions and be entered in the contest. Didn’t want you missing out! Beautiful card Laurie! So excited to play along in your new favorite challenge! Can’t wait for the next one 🙂 !!! When I go to save the picture it says failed due to copyright laws. Anyone else having trouble posting the picture to instagram? What am I missing? Annette, you can get a repost app and repost it from Instagram, or you can take a screen shot and then post it (when I do that I always note that it’s a reposted pic and credit the source). How fun! I’m hoping to get back into participating this year!! The new Challenge page is fun and I managed to enter all 3 this time. I will say, however, that using Instagram is a real challenge in itself and I’m not a fan. I tinkered with it all day before I figured out how to post both the challenge picture and my entry in one post. I’ve had an Instagram account for a while to look at other works, but have never tried to post. Who knew that you can’t post from your computer? I really hate posting from my phone, but it was good to at least understand how it works. Looking forward to the next Wednesday challenges! I feel the same way about IG! Finally started posting mostly PTI cards, as I know it’s easier for companies to use than checking out our blogs. However, it will never replace blogging for me. I did finally discover that you can download IG onto your laptop & edit your posts as well as like & comment on posts. Much easier than using a phone & you can actually see the project! I’ve been surprised at what a card really looks like when I pull it up on my laptop. Is there a place to see all the entries? And will the winners be posted separately, on this post, or on next Wednesday’s post? Was wondering the same. It said it would be posted here on February 13 after 6a.m. Can’t find it either. Winners are posted on each week’s post on Wednesdays after 6 am ET. Maybe we are still waiting to see the winners? I’m wearing out my refresh button. As patiently as possible, of course! I suppose since it said after 6am it could technically be anytime after that time and it could be like the blog hop where it took days for a winner to be chosen. I too have been checking periodically and it would certainly be nice to know. We can to nothing except be patient and wait.